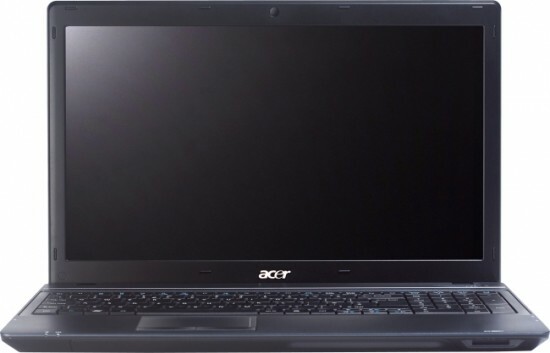 Acer has recently announced the launching of its new laptop TravelMate 5542. The TravelMate line-up of notebooks is targeted towards business consumers and the Taiwan based computer manufacturer, Acer, has released a new addition to this series – the TravelMate 5542. This machine is supposedly equipped with an AMD central processing unit, an integrated ATI video card, a Bluetooth module and a web camera. In addition, the system is apparently powered by a copy of Windows 7 OS. This portable computer reportedly comes with an AMD processor and users can choose between Athlon II P340 (ranked 134 on our CPU Benchmark list) and Turion II Dual-Core mobile CPU. The former has 1MB of L2 cache and is clocked at 2.2GHz whereas the latter has 2MB of L2 cache and is clocked at 2.4GHz. The TravelMate 5542 supposedly can house up to 4GB of system memory. Furthermore, this laptop features a high capacity hard drive – either 250GB or 320GB. As for the display, this device is equipped with a 15.6-inch wide screen which has LED backlighting and a native resolution of 1366-by-768 pixels. The display is apparently powered by an integrated ATI Radeon HD 4250 graphics controller (ranked 179 on our GPU Benchmark list) which provides full support for DirectX 10.1. Consumers can connect to the Internet thanks to the built-in Gigabit Ethernet and 802.11b/g/n wireless adapters. In addition, the Bluetooth antenna and the 4-in-1 card reader make it easy to exchange files with other devices. Other connectivity features include an HDMI interface (for watching videos on an external TV), a VGA port, a multi-gesture touchpad, a digital microphone, speakers as well as a 1.3 megapixel Crystal Eye web camera which together with the Acer Video Conference software make video calls possible. The TravelMate 5542 supposedly weighs a little less than 6lbs (just under 2.7kg). In addition, this portable PC comes with a 6-cell Lithium-ion battery which is said to last up to 3 hours. Moreover, the notebook runs on a pre-installed copy of Windows 7 Professional OS. The new Acer TravelMate 5542 is available in the US and costs $549 (approx. €403).